On 26 September 2017, Belarusian officials declared plans for the liberalisation of the economy by developing a new decree on freeing up Belarusian entrepreneurship. Moreover, on 28 September, the First Deputy Prime Minister of Belarus Vasily Matyushevsky announced the government’s intensions to encourage further growth of the IT-sector. The latest statistical figures on the development of the Belarusian economy, though optimistic, are still far from promising. According to the latest data from Belstat, a government agency for official statistics, the Belarusian economy is slowly starting to recover. 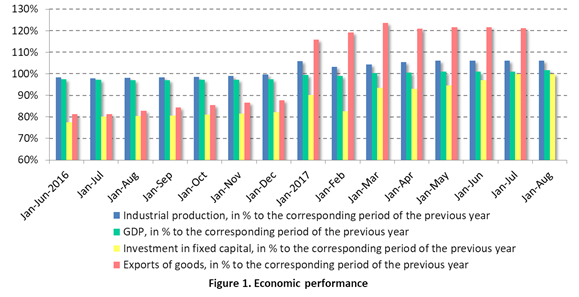 In the first eight months of the year, growth of industrial production equaled 6.1 per cent, GDP grew by 1 per cent and the volume of foreign trade rose by more than 20 per cent (see Figure 1). However, a deeper analysis of the figures reveals that officials’ increased optimism rests on shaky ground. First, trade turnover in 2016 dropped by 12.4 per cent, while a year earlier it declined twice as much. Second, the rise in global commodity prices mostly explains current achievements. For example, compared to last year the price for the Belarusian refinery products rose by 63 per cent, and ferrous metals by more than a third. Overall, export prices increased by 20 per cent, while the physical volume of export supplies improved only by 3.1 per cent. Third, Belarus’s export structure has not changed. It still comprises mostly agricultural products, refinery products, potash fertilizers, and metals. Moreover, the share of high and medium-technology goods in total volume of Belarusian exports to the EU does not exceed 2 per cent. Finally, despite the best efforts of Belarusian officials, the share of exports to Russia in the first half of the year accounted for more than a half of total turnover (not much different from last year). Accordingly, the trade turnover with EU countries increased only by 14 per cent, with the total share equalling 23 per cent. Therefore, any optimism about a recovery seems a bit premature, taking into account the absence of assurance that current pricing trends will continue longer into the future. Meanwhile, on 26 September, the government submitted a key document to aid liberalisation of the Belarusian economy, the draft decree “On the Development of Entrepreneurship,” for consideration by Belarusian president Alexander Lukashenka . The decree proposes the following changes. First, the government will systematise and reduce administrative requirements (procedures for obtaining certificates, approvals and other permits) in order to simplify entrepreneurial activities. Second, the decree advocates the formation of predictable tax legislation with the aim of ensuring a stable situation in the tax sphere. In particular, the government plans to introduce a ban on the introduction of new taxes or the increase of tax rates till 2020. Third, the decree introduces a new notification procedure (by way of “one window” services or by implementing an e-services portal) for some of the most common types of economic activity for small and medium private enterprises (household and travel services, transportation of passengers and cargo, production of agricultural goods and building materials). Fourth, the decree cancels the need for licenses for 3 of the 36 currently licensed business activities. It also streamlines 20 additional licensing components for the remaining activities. Finally, the government will attempt to transform the economy to focus on information technologies. Particularly, the First Deputy Prime Minister of Belarus Vasily Matyushevsky has acknowledged further development of Belarus High-Tech Park. As a whole, the decree aims to change the mechanisms of interaction between the state and businesses. The hope is to minimise state intervention in the activities of private companies and to strengthen the mechanisms of self-regulation for entrepreneurs. However, the government still insists on maintaining a level of control over the economy. Later, on 28 September, during the Belarus Investment Forum held in Minsk the First Deputy Prime Minister of Belarus Vasily Matyushevsky praised the success of the measures taken by the government to support businesses in general. Matyushevsky stated that Belarus occupies the 37th place in the latest World Bank’s Ease of Doing Business ranking and grades among the ten countries-leaders in the reform of legislation. As a result, the number of companies bringing in foreign capital is growing—40 per cent more in comparison with 2014. Discussion during forum touched on several topics, including investment in the real sector, technological and human resources of Belarus, and growth drivers for the Belarusian economy. Additionally, participants have evaluated the possibility for a transition from a “catch-up development” strategy for Belarus to a “harmonious integration into international value chains” strategy, which envisions generating a stream of FDI into the country. Moreover, the officials have stated that Belarus will continue reforms in order to support promising sectors of the economy, developing modern technologies, and increasing of the role of private sector. However, World Bank Country Director for Belarus, Moldova, and Ukraine, Satu Kahkonen has argued that, along with the many opportunities, several risks remain in store for Belarus. Kahkonen noted that Belarus can no longer rely on its traditional position in the market. Global driving forces have changed: the prices of raw materials will not be as high as in previous years. 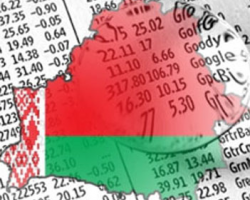 This means for Belarus that it cannot rely further on high commodity prices. 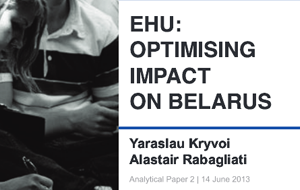 If Belarus stops developing and reforming, it will fall into the trap of slow growth. She added that additional growth factors for Belarus should include high level education, infrastructure development and taking advantage of its geographic location between EU and non-EU states. In total, while the government demonstrates commendable efforts in the legislative sphere and tries to assure foreign investors with good economic development prospects, the economy still awaits more proactive steps and shows only temporary signs of recovery.